Roast Stuffed Pumpkin with sausage, for a special Fall dinner – a meal for 2, a festive side dish for a dinner party. We got a lovely little pie pumpkin from our CSA. I really should have taken more pictures of it – it was prettier than the one I used last year for some of my header pictures. Now, I can always simply bake it and use the flesh for various squash dishes, as I did last year. 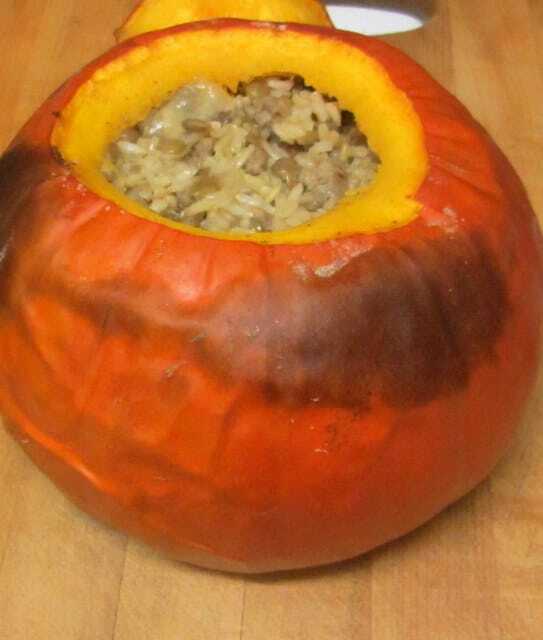 But this time, I thought I’d share one of my favorite special Fall dishes – a roast stuffed pumpkin. I’ve made this for an ordinary meal for ourselves, as a treat, but I’ve also served it as a side dish at dinner parties, and holiday meals, because of the elegant presentation. I used sausage in this, but if I have a vegetarian at the table, I’ll omit that, add more lentils, and have something I can serve as a side dish for everyone that can give the vegetarian a substantial part of a meal. I started with this lovely little pumpkin. Which I realize (too late) I should have weighed or otherwise measured to give you an idea of size… sorry about that. It was… um… a fairly typical pie pumpkin, neither particularly large nor small… That cutting board it sits on is 12″ wide, if that helps! In general, though, I go with whatever size I get or find – if the stuffing doesn’t fill it, that’s OK. If there is extra, I’ve put it in the baking dish around the pumpkin, or in a separate baking dish – or even just left it for another time. Anyhow – starting with the pumpkin. I cut the top off, carefully, as I want to replace it both for baking and because it is an attractive presentation. 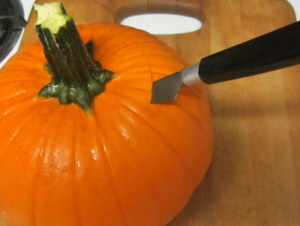 I therefore cut at a sharp angle, so the lid would rest neatly on the walls of the pumpkin. You can see how that works. I don’t mind some irregularity in the shape of the lid, as that actually makes it easier to line up – but I don’t want something that will fall inside. Then I scooped out the insides – the seeds and stringy pulpy part. Once the inside was clean, I sprinkled it very lightly with salt and freshly ground pepper, and set it aside to marinate. The salt will pull out some liquid – I just periodically swirl it around to cover the inside with the seasoning. How much salt and pepper you use will depend on both your own taste but also how highly seasoned the sausage you use it – if it is hot and salty, you won’t want much seasoning in the pumpkin itself. I really used just a pinch of salt and a few turns of the pepper mill for this. Shortly before it is finished, preheat the oven to 400°. Take the pumpkin and fill it with the stuffing. You want to pile it in loosely, not pack it in tightly. Then replace the lid, and put it in the oven for 45 minutes. Now – you have some freedom with this step. You can make the rice mixture an hour or two ahead – useful for a company meal. You can even make it the day before and refrigerate it – then prepare the pumpkin that afternoon, and stuff it right before baking. If you can, take the stuffing out of the fridge about half an hour before using it to take some of the chill off – I don’t have the counter space to do that… The timing I give is using a hot stuffing – you’ll need to increase it to an hour or a little more if the stuffing needs to heat through. 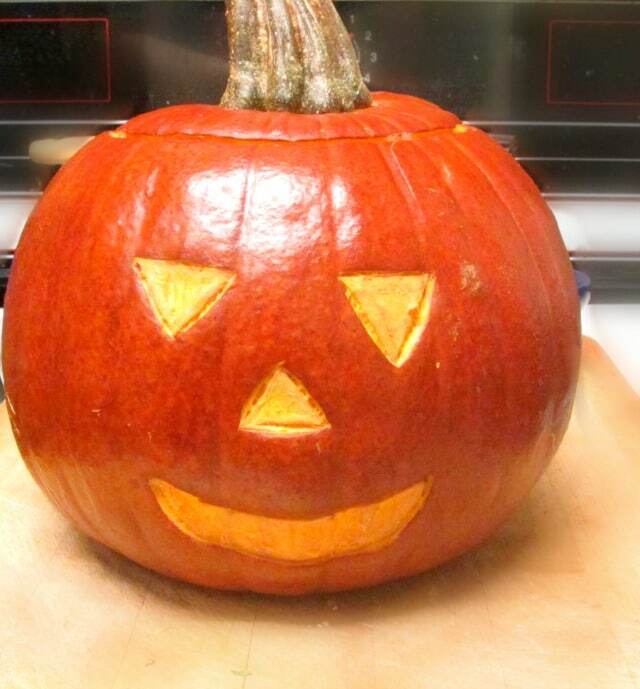 Don’t prepare the pumpkin more than a few hours ahead, though – it will dry out and be unpleasant and unattractive. Serving this to company I put it on a pretty platter and serve it at the table. (And I should have done that for a picture… but we were hungry, so I just served.) It is, of course, quite hot, so handle it carefully. 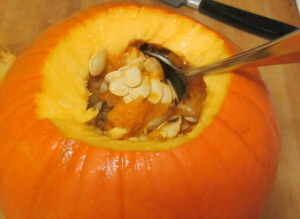 Remove the lid, and scoop out spoons full of both the pumpkin and the stuffing together. The two of us made a meal of this and a tossed salad, finished the stuffing and had about a pint of pumpkin left over – as a side dish it easily serves four to six. 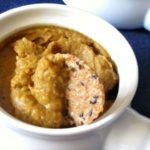 (More, of course, if more dishes are served – for Thanksgiving, say…) I love serving it with pork chops and broccoli or Brussels sprouts – it looks festive, and dresses up the whole meal, without any last minute fussing. I published this, two years ago, right before Halloween. The day after Halloween a reader sent me a picture of a stuffed pumpkin she had made the night before – with a jack o’lantern face on it! She incised the skin, and peeled it off in the shape of eyes, nose and mouth, and it was delightful! (And indeed, delighted her children, she told me.) What a perfect dinner for Halloween. So I just had to share the idea! 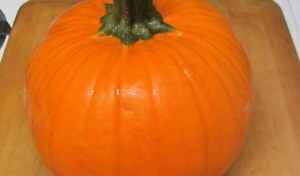 Roast a stuffed pumpkin for a special Fall dinner - a meal for 2, a festive side dish for a dinner party. 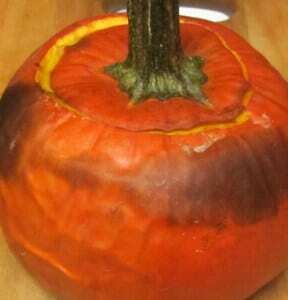 Cut the top off the pumpkin to make a lid. Scoop out the seeds and stringy pulp. Sprinkle salt and pepper inside. Set aside. Start to brown sausage in a saute pan. Add chopped onion, and saute until it is soft and the meat is browned, but not cooked through. 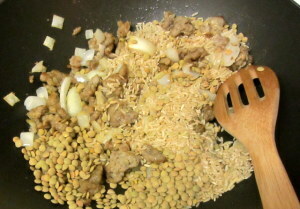 Add rice and lentils, stir around to coat with any fat in the pan, and brown lightly. Add water, bring to a boil. Lower to a simmer, cover, and cook 45 minutes until done. 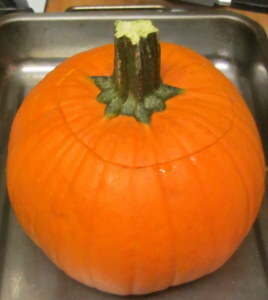 Fill pumpkin lightly with stuffing and place in a baking pan. (Any extra stuffing can be placed around the pumpkin in the pan.) Bake in a 400 oven for 45 minutes. Serve, scooping out spoons full of both pumpkin and stuffing together. Lovely! I do hope you enjoy it. One thing - I think you're in the UK? I don't know how they describe them there... 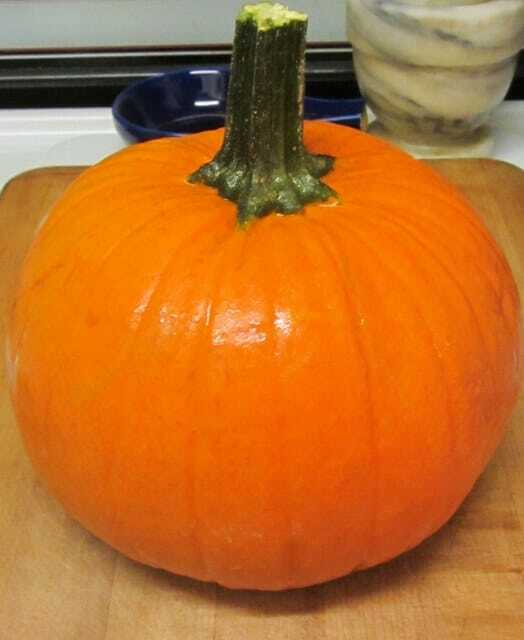 But be sure to buy a small pie pumpkin, not a big one meant for a jack o'lantern. The big ones have very little flesh for the size and are mealy... but the little ones, like any other winter squash, are sweet and rich. 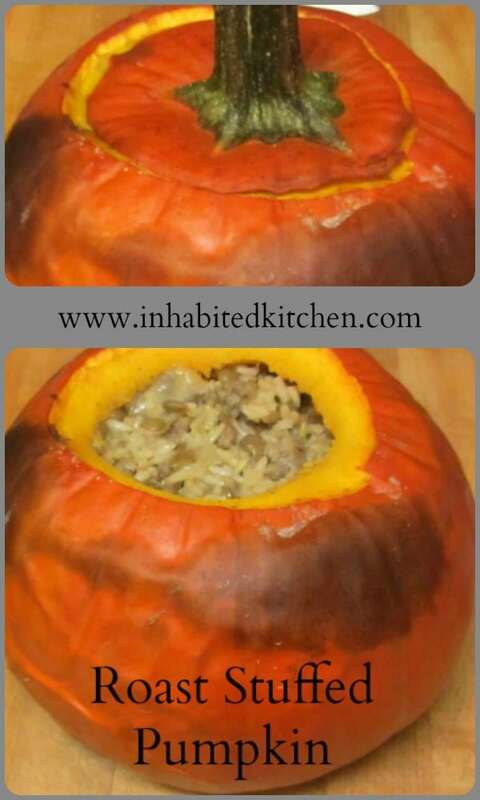 (They're the ones really intended to eat, not just admire...) And this will work for stuffing other winter squash, if you ever don't have pumpkins - I just really like this presentation, though. What a fun idea for Halloween! So festive! I love this idea! I've never cooked pumpkin like this before and it sounds so tasty and festive. What a wonderful way to incorporate pumpkin this time of year! We make stuffed pumpkin all the time in the fall but ours is totally different! My mom and her mom have been making it for as long as I can remember. We cook the pumpkin for a bit with brown sugar then stuff it with sautéed ground beef, onion, and yellow potato all mashed together - totally Frenchie and not terribly good for you. I can wait to try the way you do yours. It looks like an great dinner or breakfast and healthier! What a great idea, I often see these smaller pumpkins this time of the year so will have to try this. It doesn't get more autumnal than this dish! Stuffed squashes are one of my favourite things to cook in fall, but I have never tried it with a real pumpkin! They looks so fun to eat! Such a wonderful idea! I am having a party soon so this is a perfect way to surprise everyone! Very creative and I am sure very yummy! these are SO cute! I love the idea of stuffing a pumpkin! can you actually eat the insides? i always thought those types of pumpkins were decorative! What a wonderful idea. And how sweet that you got a picture from a reader who made it and even carved it. Such a great Halloween-themed meal!! This sounds lovely and cozy and utterly perfect for an October meal! This is so inventive! And I agree that is the most perfect pumpkin I have ever seen. I miss getting a CSA box. Always so many fun surprises! Yummy. 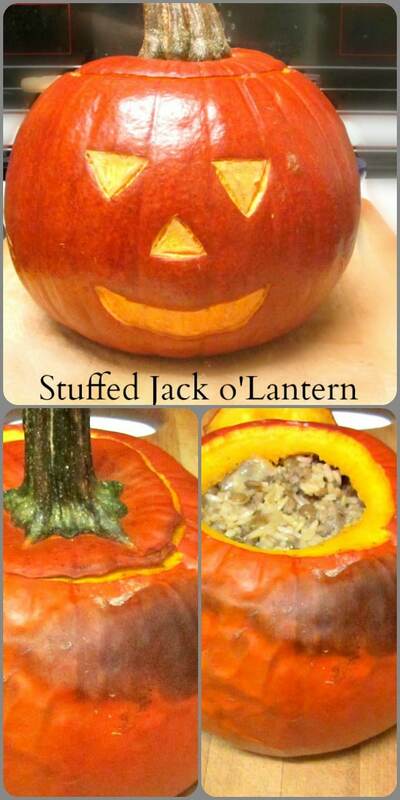 What a fun idea to make the meal in the pumpkin and I love the carved face idea! This is so creative. We just love pumpkin and always lOok for new ways to cook it. Trying this soon. Pinned! This reminds me of my childhood. My mom uses to carve out a pumpkin and roast the seeds every Fall. I never thought about putting an entire meal in a pumpkin. Cool! What a great way to use up pumpkin! I never knew you could eat those pumpkins! Need to try this! 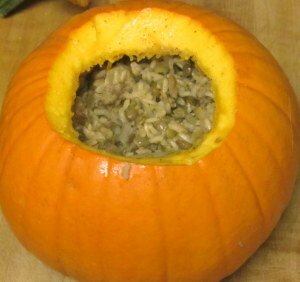 what a fun idea to cook the meal inside the pumpkin. this looks great n appetising.